It’s regarding the "myths" behind Columbine. I remember this event pretty clearly. Because it sort of hit close to home. I was just out of high school (graduated in 1998). I was a gamer, and for my last 2 years of high school, I wore a black leather trenchcoat. This was before "goth" was popular. At least not in my town. I was an outcast, i had a very small group of friends. I’ll admit though, that this was mostly by choice. I didn’t really like most of the people in my class all through grade school. At about 5th grade, when kids start turning into teens, they start to notice that everyone’s not the same, and they form opinions on who’s worth their time and who’s not. Well I was always pretty open, and friendly. I didnt pass judgement on people on my own. People were people to me, other kids my age were just other kids. I didnt care what kind of clothes they wore, or whether they looked rich or not. Unfortunately everyone around me was starting to form those opinions, I didnt have the cool clothes and those $100 sneakers. I didn’t play sports. So I was slowly removed from the cool groups. Everyone else started to "mature" and i just kept doing what made me happy, not what they dictated as the cool stuff to do. This could very well be why I didnt get into drugs, and under-age drinking. But I’m getting off topic. My point is, I was those kids, as the newscasts described them. A loner (sort of), semi-goth (trench coat, no piercings, eye makeup, or 100% black wordrobe), and I was into violent computer games. I liked explosives (see the tennis ball bomb post! ), and guns. The big difference between me and the image the media portrayed? I like to think I was more in control of my life and psychological state. I respected things that could kill me, or others. I never saw my high school as a level in Doom. So for the past 10 year’s, I’ve felt like I could sort of relate to these kids. I don’t in any way condone what they did, just that I could see where they were coming from. Ridicule in High School is terrible, and to a kid thats already depressed or unstable, it could easily turn into what happened in Columbine. What they did was terrible, but the picture the media painted, almost made them look like as much a victim as the actual victims! So back to the article. Apparently, these kids were not the loners that the media made them out to be. They were not the victims of bullying that the media made them out to be. Apparently, they weren’t even members of this "Trenchcoat Mafia" that they were so linked to. The group that actually called themselves the trenchcoat mafia had graduated a year before. My guess is that they just tied them to that group because of their coats, and the fact that the group was so fresh in everyone’s memory. All of this information came from eye witnesses (students and whatnot interviewed afterward). You know, the kids that actually knew these guys. Their goal was actually to bomb the school, and not go on a shooting spree, according to their journals. So, at any rate, theres the dump of my brain for the day. Hope you enjoyed the reading! Over the past week or so, I’ve been trying to figure out a way to get XM Radio Online to work in Linux. I just wanted to share my experience, findings, and eventually, success! XM’s online web player does not work in linux. Or, I havent been able to get it to work anyway. I’m running Fedora Core 10, when I tried to load a stream throug the XMRO web interface, firefox loaded a player (i think it was totem, but its difficult to tell…) and basically hung. Not firefox,the player. It loads embedded in the page, and you cannot interact with it. I assume trying to load the stream hung the player. It uses qt, so you’ll need qt installed, maybe even KDE. I already had KDE installed, so I did not need to install qt. I did need to install qt-devel through yum in order to get qmake. You basically download the package, make sure you have the dpendancies, and then qmake, make. I ran into some issues, detailed in this thread on linuxquestions.org, http://www.linuxquestions.org/questions … ec-717227/. Detailed in that thread, you’ll see links to downloads for the codecs needed, and the packages you’ll need to grab from yum to get xine setup with the right libraries. Thus far, I like the player. It loads my presets, and channel data from xmro. It displays the song title and artist, and it doesnt have the 2 hour cut off that the web player has. Good app, alittle difficult to setup, but with the info in that thread you should be good. So about a month ago, Jess and I decided to adopt a dog from the shelter. We’d lost lady a while ago, and theres a hole where she used to be in our family. So we thought it was the right time to save another pooch from the pound. Jess went on up to the shelter on a day i was at work. Picked out a dog that we saw online. Her name is Lola, and according to the shelter, she’s 2. She’s a cute dog, but has no obedience training. 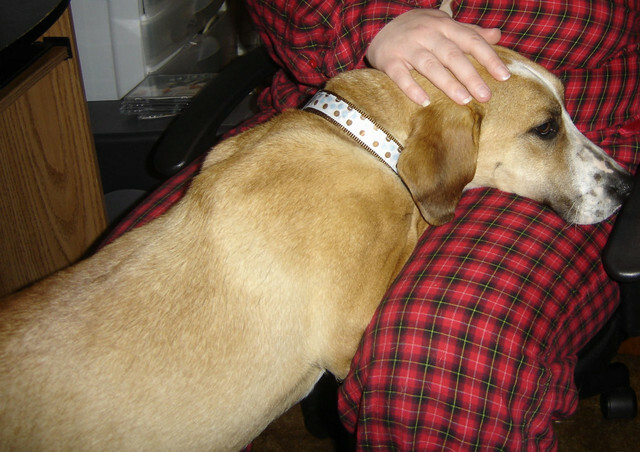 There she is looking cute laying her head on Jess’s lap. When we leave (like, you know, to go to work!) she turns into satan incarnate. When we first got her, we werent sure how her and our doxie, Hannah were going to get along. So we would lock Lola up in the "dog room" and leave Hannah out in the main part of the house. Hannah’s pretty good, so we’re not too worried about her causing trouble. They both behave, we’re good. Well we finally decided that it was time to start putting hannah in the room with lola. But we still weren’t sure that we wanted to actually put them together. So we borrow a small dog crate from my mom. And put hannah in the crate, and lola in the room. We go to work, come home, all is well, lola knocked over some stuff in the room, but otherwise, not so bad. The next time we leave them alone is to go to breakfast with my dad. We do the same thing, lock hannah up, and leave lola in room. Well she has a fit. We’re gone for about an hour. In that time she destroys an old ironing board, a blanket, tears the screen out of one of the windows and just generally makes a mess of the place. We still have to go grocery shopping. so in my anger, i throw (not literally) lola in the cage, and leave hannah out. The cage isnt so small that she doesnt fit in it, it’s just slightly too small for her. Dont go thinking i’m some cruel inhumane dog owner. So we go grocery shopping. Again, about an hour we’re gone. We come back to find that lola has managed to pull the dog bed that was sitting in the dog room into the cage, along with a quilt that my mom had made for our old dog lady, and has destroyed them both. Well we’re obviously not happy about this. but what can we do? We’re not the kind of people that would send her back to the shelter, so we try to come up with better solutions. OK, so the problem was that there was something destroyable close at hand, so monday when its time for work, we make sure she’s not near anything. Jess gets home before me, to find that the dog has managed to turn the cage on its side, and then stick her head out the bottom, she then proceeded to tear up the floor! Ok, what can you do about that? we take the cage and wedge it between the table and one of the cabinets thats back there. She manages to knock the one wall of the cage out, and get out of the cage. Wreaks havoc in the room. When i get home, i take thick copper wire and reinforce the connection points for that wall of the cage. She knocks out the OTHER END of the cage, gets out, and wreaks havoc. I tie up the other end like i did the first one. We order a larger cage. I take two pieces of plywood, and lodge them beside the cage between the table and cabinet. Lola knocks over the cage, and plywood, somehow gets the cage back over to where she destroyed the floor, and destroys it more. I use hammer staples to attach the plywood to the sides of the cage. 9 staples hold each piece of plywood to the cage. Lola removed 3 of the staples, and still managed to get the cage out of the corner, and into the middle of the room. Knocked it over. I take two 4′ lengths of 2×4 and attach them to the bottom of the cage to keep her from flipping it over, the new cage has a tray, so now she cant get out through the bottom, right? Lola shreds the tray, and manages to get one of the 2×4’s off of the bottom of the cage. I’m getting tired of this by now. Every night after work i’m either fixing this cage, trying to outthink a damn DOG! or working on Jess’s car because its having electrical problems. Hell with it. I take a small wooden frame, and drill drywall screws directly through it, through the bottom of the cage, and into the floor. I figure, she’s already destroyed the floor, what more harm can a few screws do!? Now she cant move the cage, so instead, she CHEWS BARS OUT OF IT. Yes, she chews bars out of a METAL CAGE. She gets enough out that she can start to destroy the table next to her cage. She also manages to split some of the clips that hold the walls of the cage on, and gets partilally out of the cage. Jess comes home to find her halfway out of the cage howling. Tonight, i welded the edges of the cage. And welded a 1/8" plate over the spot that she chewed the bars out of. I then screwed the cage back into the floor. This is getting rediculous. I dont mind a challenge, but this is NOT supposed to be this hard!